This film is a part of a Double Feature with Airplane. When two movies that are screening in the same theatre are grouped under the same thematic heading, one ticket is good for both features when viewed back-to-back on the same day (except as noted). Cleavon Little, Gene Wilder, Harvey Korman, Slim Pickens, Madeline Kahn, Mel Brooks, and Dom DeLuise. 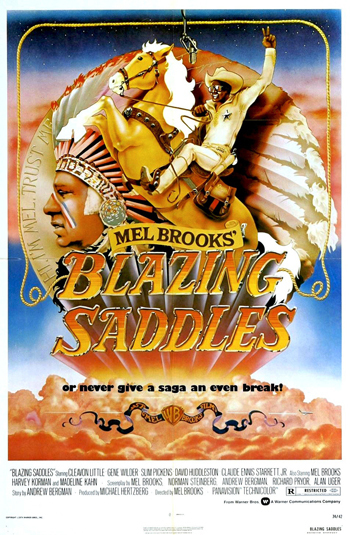 More like “How the West Was Fun!” This hilarious romp through the frontier from spoof legend Mel Brooks leaves no tumbleweed unturned in its hilarious dissection of the Western. From the charismatic Cleavon Little down to cameos from Dom DeLuise and Brooks himself, this stacked cast of legends strikes comedy gold.